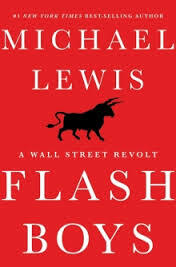 This is a very informative book on a very confusing subject and although I think Lewis does his best, the complexities of computers and the internet in the stock market are still not completely clear to me – but I learned a lot. Part of the reason is there is no straight forward chronology. Lewis is known for his reporting in the fields of finance and sports and I’ve now read 3 of the finance books – all very good! “Dark pools” were exchange companies established by some very large investors to gain private and faster access to better trades. Dark pools hid their trades from the public. Dark pools were scary. They were predatory. Into this arena came a company which simply built their own very straight (!) fiber line from Chicago to New York. Then they played hardball and sold time to banks and brokerage firms. When this new fiber cable came into play the users of that fiber line got a huge advantage 3 milliseconds huge. And then along came Brad Katsuyama, a guy out of a Canadian bank who wanted answers. Along with a partner, Rob Park, and a few others, he developed a little analytical tool called Thor to beat what the dark pools did. Thor delayed actual trades. But that wasn’t enough, in Brad’s mind, to level the playing field, so he decided to start his own exchange. And he brought some impressive talent on board. Together, these guys were going to clean up Wall Street.